Good Food! Good Auction Items! Good Cause! 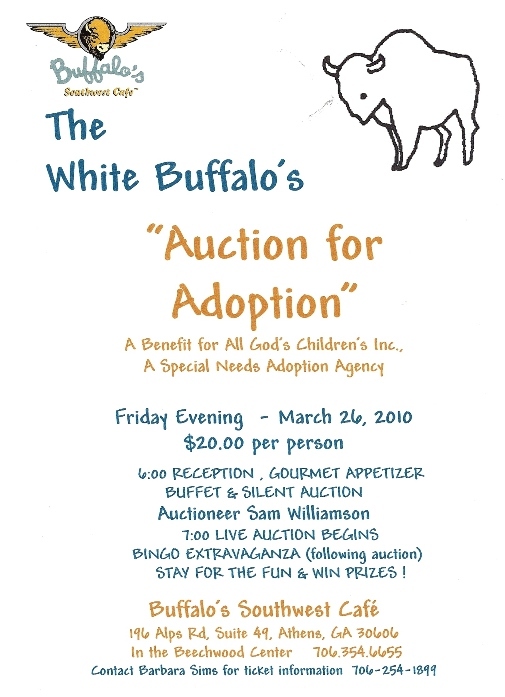 Fun & Fellowship, all at Buffalo�s Southwest Caf� at 196 Alps Rd, Suite 49, Beechwood Center, Athens, Georgia 30606. Good Food! Good Auction Items!Good Cause!Fun & Fellowship, all at Buffalo’s Southwest Café at 196 Alps Rd, Suite 49, Beechwood Center, Athens, Georgia 30606. Tell your friends, treat yourself and HELP Special Needs Children.